There are some weeks when Friday just can't seem to arrive quickly enough for me. Those weeks occur primarily when Todd is on the road, Tsia is teething, and/or nothing seems to be going right (i.e., my way. How presumptious of me to assume they should go my way!). The past few weeks, however, have passed with amazing ease and speed. Maybe it's because Todd has been in town for three solid weeks. Maybe it's because we're still all healthy and it's already March (aside from an enormous re-injury to my knee which I just refuse to mention or think about)! Or maybe it's just because we're all so busy. In any case, I can't believe it's Friday already. Plans for the weekend include a visit to MoMA for Tsia and her dad (they eat waffles and visit a museum every Saturday while I teach), the start of another Beginners sewing class for me, and hopefully the completion of several projects in the works. I'm also hoping to see the Brooklyn Museum's Devorah Sperber exhibit and enjoy some balmy spring weather at the park. Tsia and I picked up this little sparrow and it's nest while at Tinsel Trading the other day. We thought she looked a bit lonely, so I've made her some little eggs out of Paperclay, and now she seems happy and hopeful for spring. 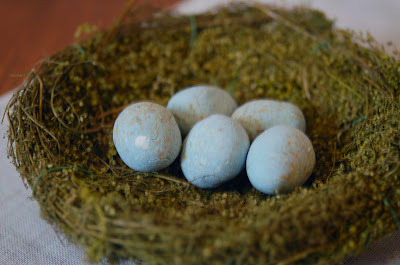 I love Paperclay because it's lightweight (I've used it to make ceramic-looking Christmas ornaments before, and they weigh almost nothing), you can tint it with color as well as paint on it when it's dried (I used gouache), and--best of all--those little eggs bounce instead of breaking. Lucky mama bird; she doesn't need to worry about her babies getting hurt; lucky me, because I keep dropping the eggs. The wooden matching game is called Touche et Trouve, and it's manufactured by Vilac. I bought it at Kid O here in New York, and they may be able to help if you contact them. Thanks for your lovely comments about the bag! Regarding the interfacing I use, I like heavy-weight sewn-in interfacing or canvas for bags that need structure without too much stiffness. And I use a Timtex for the base, but I have a secret way of sewing it to eliminate all the bulk from the seams. I'll think about doing a tutorial or a pattern for this bag if there's a lot of interest. Let's see. What else? Oh yes, here is a close-up of the veggie silk ribbon embroidery in Martha, for those of you who don't have access to her magazine. I haven't decided whether I'll be embroidering vegetables or something else, but I think I'll be doing it on linen, no matter what I make. And that's about it for now. Have a great weekend! Please please please show us the Timtex tutorial! I'm scared of that stuff after my first attempt. I would love to see a tutorial on the Timtex! I just started using interfacing so it would be extremely helpful. Ad me to the list -- I'm hoping to make a bag with some heavy fabric and timtex in the next few months and I'm dreading all the bulk in the seams. I'll stay tuned here for help! ;-) Oh, and could you think about one for paper clay? Those eggs are just adorable. You could be very busy with all of these tutorials! (But, then just think of it as the price to pay for having access to Tinsel Trading while the rest of us just drool.) Love your blog! The bird and the nest are lovely. Yours is the first blog of it's kind that I discovered and I'm hooked! My interest in sewing/creating has been revived and it's been tremendous fun. I really loved your bag and a pattern/Timtex tutorial would be terrific. I've often read how folks hate interfacing and try all kinds of ways to avoid it - I've recently discovered why! Many thanks! 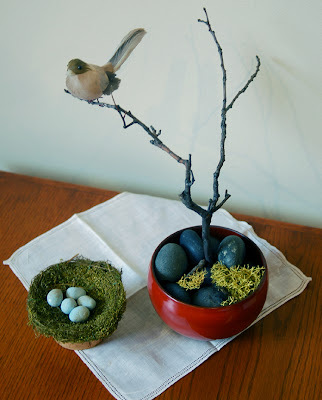 i love your sweet bird and nest! the eggs are so charming. and i agree with the other comments... would love and deeply appreciate a tutorial on the techniques in this bag. i have some timtex that i just bought and i'm a bit intimidated by it. I'm raising my hand to show interest, but since you can't see that from where you are...Timtex tutorial, please! me too! i've avoided timtex long enough. . . I've recently discovered your blog and really love what you're doing. Very inspiring. I'm a beginning sewer, surviving on tutorials, so yours would be absolutely welcome.